The concept of energy storage is not new. However, technology advancements and the increased sense of urgency in relation to decarbonisation have gradually drawn attention to the possibilities of storage. Many argue that energy storage technologies will become one of the defining features of the future energy landscape, as they will allow governments to integrate renewable energy into their grids by tackling the issue of intermittency and to reduce peak power demand. There is, however, an ongoing debate about the real potential of new energy storage technologies – at least in the short-term - given that existing UK & EU legislation and regulation do not fully support the deployment of energy storage, leading to uncertainty about future uptake. Moreover, in the UK, the decision of the British people to leave the EU has created further uncertainty with regard to the type of regulation that will (or will not) apply in the near future. For the purpose of this analysis piece, we will mostly focus on technologies that absorb electrical (as opposed to heat) energy. Current climate targets at the UK and EU level have incentivised governments to promote the use of low-carbon and innovative technologies as well as to create more efficient (or smarter) electricity grids. At the international level, the Paris Agreement adopted in December 2015 has generated further momentum behind decarbonisation. More recently, at the G20 energy ministerial meeting in early July 2016, energy ministers agreed on a communiqué reaffirming their commitment to ensure access to affordable, reliable, sustainable and modern energy for all. They also adopted the G20 action plan on renewable energy and encouraged cooperation on standards to accelerate smart grid deployment and interoperability. At the EU level, Member States agreed on a new 2030 Framework for climate and energy before the Paris Agreement, with targets (a 40% cut in GHG emissions compared to 1990 levels) aimed at sending a strong signal to the market and encouraging private investment. In the UK, the Climate Change Act mandates that the government tables legislation for each carbon budget. The Fifth Carbon Budget, adopted in June 2016, sets the UK’s emissions reductions targets of 57% against 1990 levels between 2028 and 2032. There is therefore a clear trend both nationally and internationally to promote investment in new technologies that will help meet these future climate targets. From a technological point of view, renewable generation is by nature less predictable than fossil fuel generation, which presents a challenge for electricity grids’ ability to balance supply and demand. The (sometimes ageing) electricity grid infrastructure means that new smart technologies are crucial if the grid is to become more efficient. This is particularly important in the case of the heating and transport systems, which – as countries decarbonise and decide to electrify them – could experience a sharp rise in demand. The increase in electricity demand (and overburdening of the grid) could potentially lead to a degradation of generation infrastructure and electricity network assets, creating an increase in the cost of system integration. 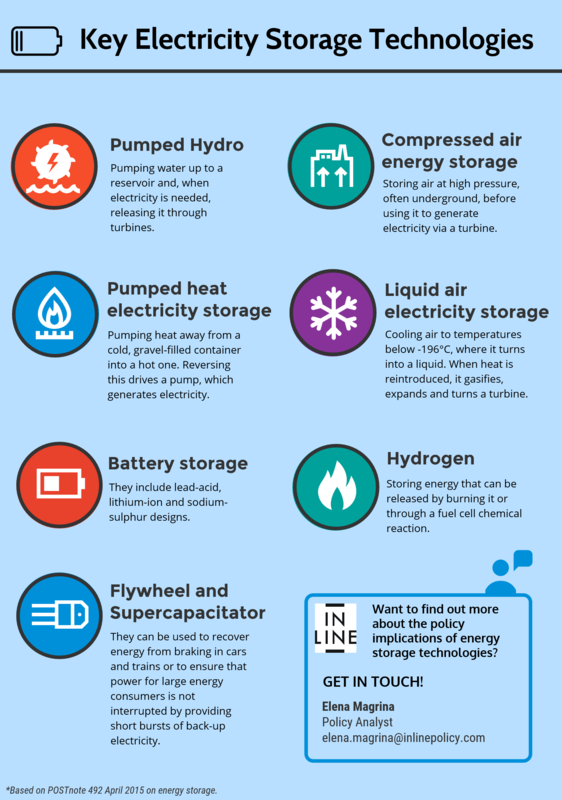 Energy storage has the potential to reduce these costs. Generation level: e.g. arbitrage, balancing and reserve power. Transmission level: e.g. frequency control, investment deferral. Distribution level: e.g. voltage control, capacity support. Customer level: e.g. peak shaving, time of use cost management. In the UK, there are no specific license conditions which apply to the ownership or operation of electricity storage assets. Storage is not treated separately and it is therefore treated as any other market participant. The rules for market participation are based on the power rating of the storage, including compliance with the Grid Code and the Balancing and Settlement Code. Electricity storage is currently included in the Capacity Market, which makes a regular payment to organisations that can guarantee to supply electricity when required, following an annual auction. However, organisations such as the Electricity Storage Network argue that the Capacity Market could be more supportive of electricity storage if the warning mechanism was changed to allow storage assets to be called to support the system at the moment of need, rather than at an arbitrary time, as electricity storage is a fast response technology. A 2015 report from the House of Lords Science and Technology Committee recommended that electricity storage should be placed under the Contracts for Difference regime, which supports new investment in low-carbon generation by guaranteeing a pre-agreed ‘strike price’. providing targeted funding and support for the development of new technologies. Since then, both Ofgem and DECC (now BEIS – Department for Business, Energy and Industrial Strategy) have been working together to manage the transition to a smarter energy system. It is a joint project that is expected to run until the autumn. As part of this project, both BEIS and Ofgem are expected to release a call for evidence on flexibility, including storage, soon (although it has been expected since May 2016). There are several industry groups that BEIS and Ofgem have been engaging with. For instance, the Smart Grid Forum, which works to facilitate the development of smart grids in GB; or Workstream Six (WS6), which considers regulatory and commercial issues, barriers and enablers to the development of smart grids. Similarly, there have been one-off stakeholder events to engage with market players. It is also worth mentioning National Grid's "Power Responsive" initiative, which allows industry players to share knowledge and identify challenges. BEIS, Ofgem, and other public bodies have programmes that fund the development of electricity and heat storage, however there are no direct incentives (such as subsidies). In 2013, public sector energy storage spending on R&D was £9m to develop lower cost technologies, and £5m on demonstration to tackle regulatory and commercial barriers. 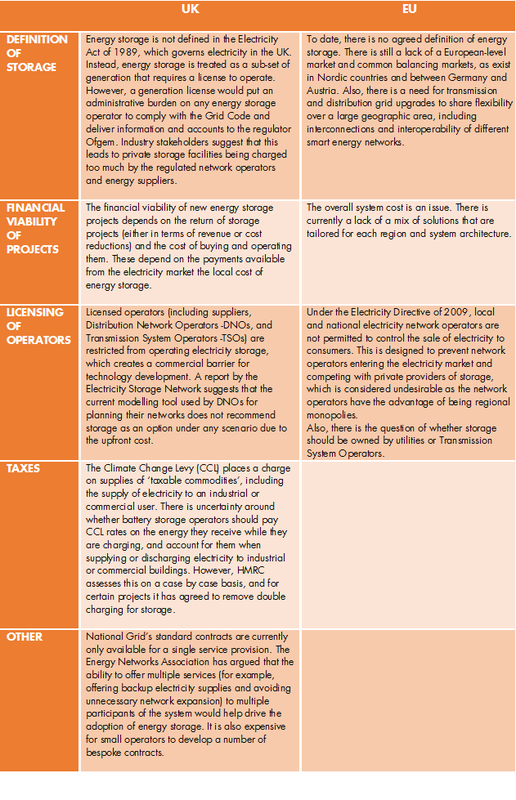 1) DECC and Ofgem should review the regulatory and legal status of storage and remove outdated barriers to enable storage to compete fairly with generation across the various interlinked electricity markets. The reforms should be proposed by Spring 2017 and implemented as soon as possible. 2) Network owners should be incentivised by Ofgem to use storage, and other sources of flexibility, to improve the capacity and resilience of their networks as part of a more actively managed system. There is currently only around 5% of total installed storage capacity in the EU energy system. This is almost exclusively from pumped hydro and is mainly located in mountainous areas. Other forms of storage are either minimal or at a very early stage of development. In 2009, the European Commission set up the Smart Grids Task Force to advise on issues related to smart grid deployment and development. It consists of five Expert Groups who focus on specific areas. Their work helps shape EU smart grid policies. The current European Commission continues to be keen to support new technologies, as it argues that energy storage can support the EU's plans for the Energy Union by helping to ensure energy security and a well-functioning internal market and helping to bring more carbon-cutting renewables online. The Commission has acknowledged that the growing need for flexibility in the energy system would benefit from new storage solutions and innovation, as some emerging storage technologies are gradually becoming more competitive. In this regard, DG Energy held a Roundtable on Energy Storage involving a wide range of stakeholders in May 2015. In its so-called Summer Package, the European Commissioned released a communication on a new Energy Market Design, including a public consultation on its proposals from 15 July to 9 October 2015. The European Commission stated that “integrating storage in the electricity market would further increase the necessary flexibility: electricity should be stored when there is a surplus and prices are low; it should be released when generation is scarce and prices are high, smoothing out variable power production.” This is new, as the European Commission’s original Third Energy Package (2009) did not mention energy storage. Subsequently, in January 2016 the European Parliament’s Committee on Industry, Research and Energy (ITRE) started working on a draft report on the new Energy Market Design. A few amendments to the report have been made since then, some of which include the concept of energy/ electricity storage. The draft report was voted on at Committee stage on 14 June. The next stage is for the European Parliament to debate the ITRE report (on 12 September) and to vote in plenary (on 13 September). The Commission has mentioned several factors that slow the development of energy storage, including administrative barriers, access to grids and excessive fees and charges. ENTSO-E, the European Network of Transmission System Operators (TSOs) for Electricity, has argued for a level playing field for energy storage, as current regulatory ambiguities act as a barrier for growth in comparison with other technologies. As part of the integration of the Internal Energy Market, the European Commission has relied on ENTSO-E to draft Network Codes and guidelines, as well as on the input of the Agency for the Cooperation of Energy Regulators (ACER). The European Commission’s proposal is known as the draft Regulation establishing a guideline on system operation (draft of May 2016). The goal is “to provide Europe with a coherent, strong, and efficient set of harmonised rules and requirements covering all important cross-border aspects of the electricity sector: connection requirements, the coordination of system operations and the completion of pan-European electricity markets.” This action comes with parallel institutional work on the full implementation and enforcement of the Third Energy Package, the enhancement of investments in energy infrastructure, the collaboration within regional initiatives as well as the enforcement of competition and State aid rules. The legally binding nature of network codes means that they can have a fundamental bearing on market participants' businesses, including on energy storage providers. This new regulation is expected to enter into force after the European Parliament and the Council of the EU have scrutinised the proposal in the summer of 2016. The Commission believes that this should help to address some of the barriers that energy storage is facing at the EU level. In terms of funding, the ‘stoRE’ project, co-funded by the Intelligent Energy Europe Programme of the EU, aims to create a framework to allow energy storage infrastructure to be developed in support of higher penetration of variable renewable energy resources. Target countries to identify a series of improvements/applications include Austria, Denmark, Germany, Greece, Ireland and Spain. There are also other sources of EU funding, such as the EU's Connecting Europe Facility (CEF). On 2 August, a Northern Ireland project developed by Gaelectric that plans to use compressed air to store energy received an additional €8.3m in EU funding through the CEF. The project is set to provide large scale storage capacity to Northern Ireland's grid and help better integrate electricity generation from renewables project. Although there are several barriers to the commercialisation of energy storage technologies, both in the UK and the EU, policymakers are working to address these issues to allow the industry to take off. It is worth noting the case of Germany, an EU Member State whose energy storage sector - according to reports - is set to hit £780m by 2021 (up from £128m at the end of 2015). Germany has one of the biggest installed renewable capacities; has decided to move away from feed-in tariffs; has high retail electricity rates; and provides incentives for homeowners to pair energy storage systems with new or existing solar instalations. These are all positive signals for an industry which is actively looking for accomodating regulatory frameworks. Energy storage technologies have the potential to revolutionise the energy market not only in the UK, but also across Europe and the world. In the context of decarbonisation following the Paris Agreement, energy storage is seen – perhaps more than ever – as a potential solution to the issue of intermittency of renewable technologies. However, key challenges remain: ageing infrastructure grids across European markets and regulatory issues, such as the lack of a definition for energy storage, are not enabling a quick take-up of these technologies at the time when it is arguably needed most. the Energy Union is one of the Commission’s flagship initiatives. But despite the R&D support provided, the Commission and other EU institutions have not put storage front and centre of their Energy Union priorities. There is still time for them to put this right.